A recent project involved the design of Art Deco folding security panels to secure the alcoholic assets of a CBD Sydney bar. 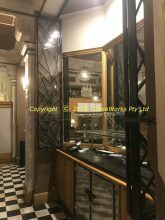 The Reagh Bar at the Castlereagh Boutique Hotel needed to leave their bar stock on the shelves behind the bar rather than having to put it all away each night and re-stock the following evening. 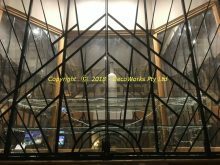 The Art Deco era Castlereagh Hotel opened on September 12th, 1927 and was built by the New South Wales Masonic Club. It was the first reinforced concrete building in the Sydney CBD and, at the time, was the tallest building in Sydney with 12 floors. Its construction set the precedent for future CBD buildings. 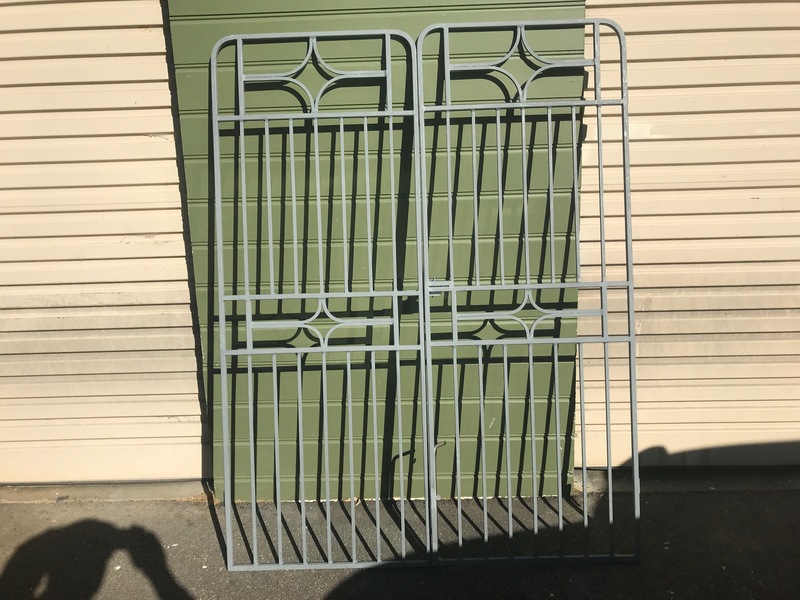 It has been the base for the Masonic Club ever since and they wanted something sympathetic to the Art Deco era of the hotel for the folding security panel design. 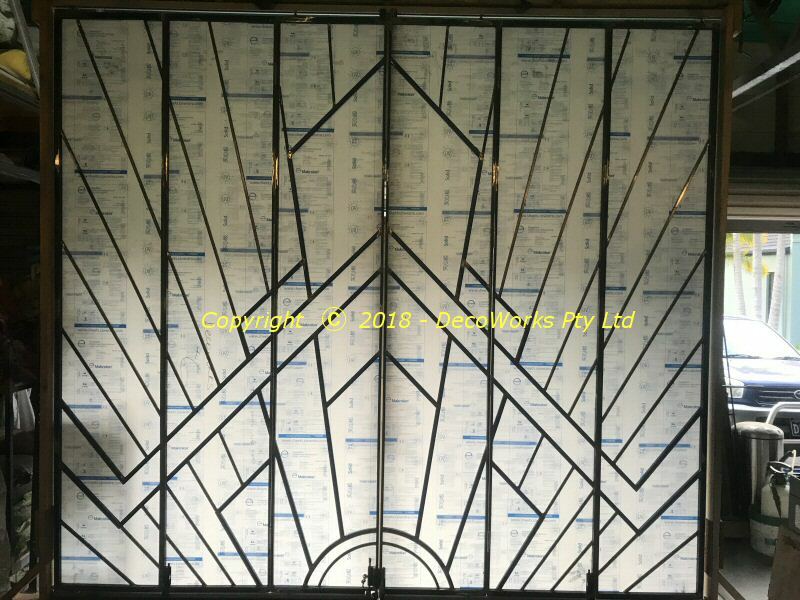 Our PLAZA style Art Deco design was selected as the optimum style for the folding panels. 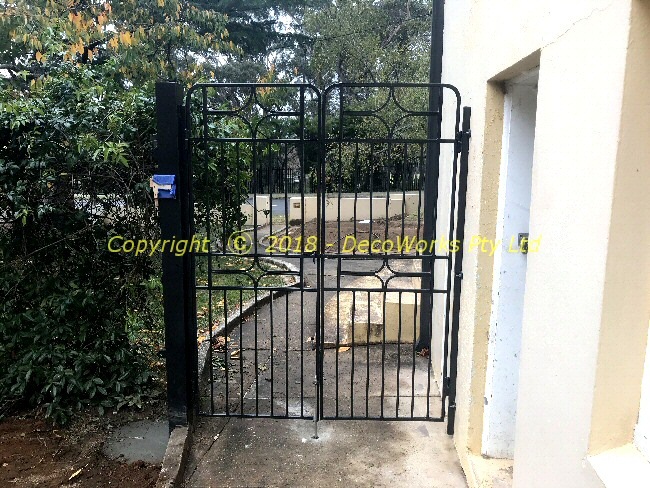 The design brief was for security panels that could be easily locked and opened and not be too obtrusive. 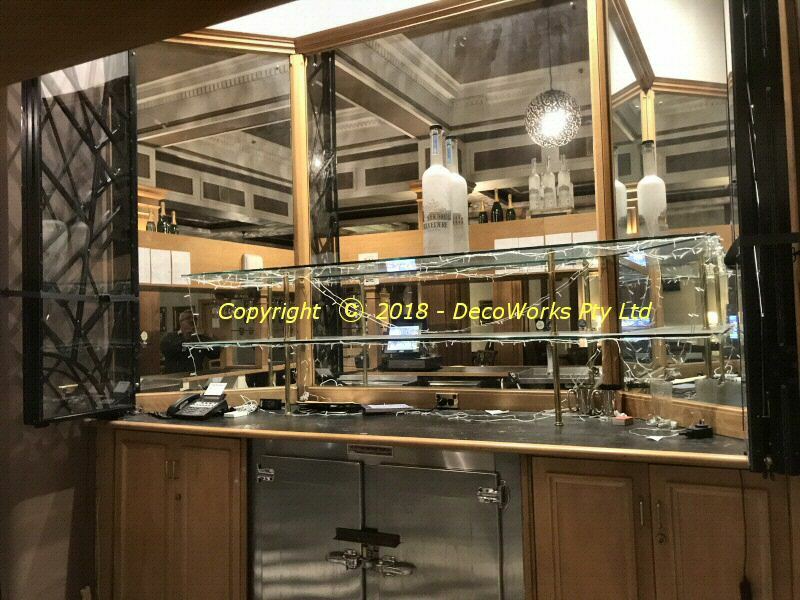 A set of six centre opening Art Deco style panels were designed that satisfied the brief while keeping the overall look light and airy. 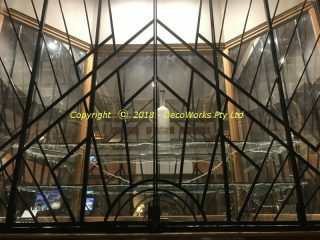 Clear polycarbonate panels were attached to the back of the folding panels to prevent access to the the bottle stock through the steel bars when the panels were locked closed. 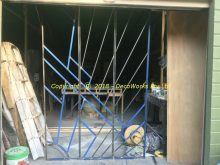 The following photos illustrate the construction of the folding panels. 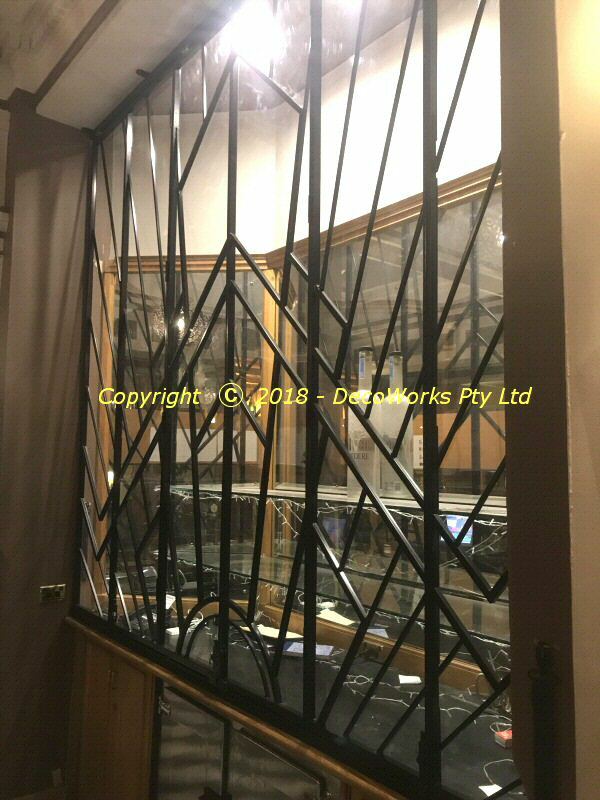 To keep the visual impact of the bars to a minimum 20mm wide framing was chosen. To avoid having two adjacent 20mm vertical bars together making 40mm wide vertical sections 20x10mm solid steel verticals were used which presented a combined 20mm width overall. 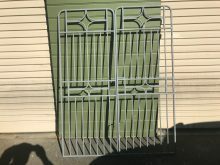 This made attaching the clear polycarbonate back panels difficult. 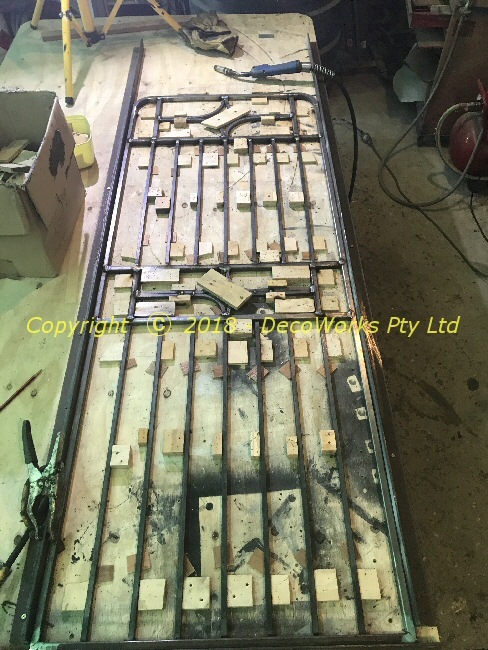 Since each panel required forty screws to attach to the frames they had to be individually drilled and tapped into the solid 20x10mm sections to accommodate the fastening screws. 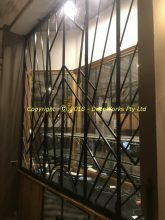 The geometry of the six folding panels was crucial and they had to be millimetre perfect so they would meet in the middle of the bar section and lock together. 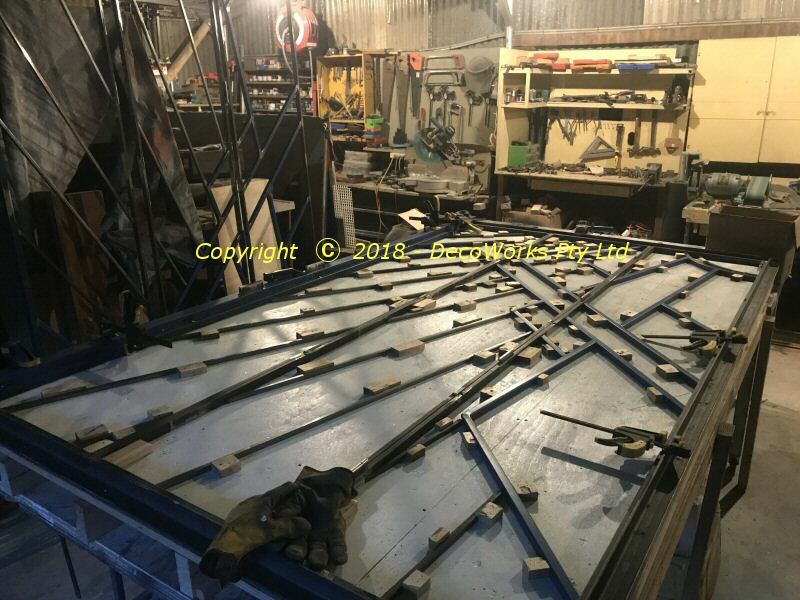 The top and bottom sections of the frames were hollow 20x20mm SHS steel and only 1.6mm thick so 12mm thick sections had to be fitted into them so the pivots had something solid to screw into. 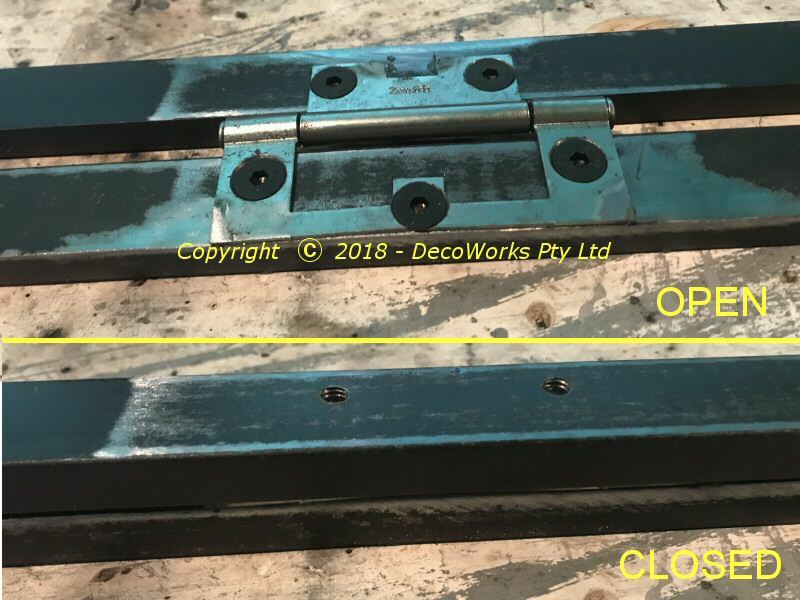 Vertical bar section hinges showing open/closed positions. 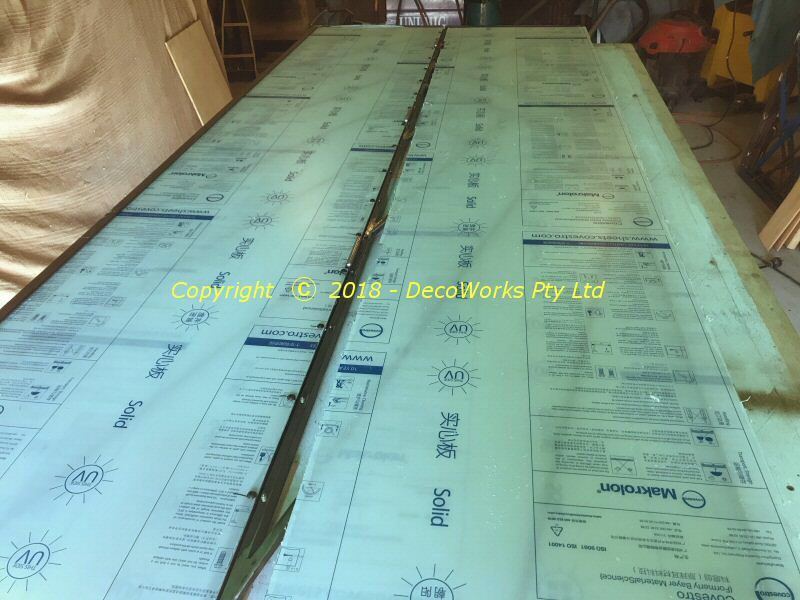 To keep the overall look light and airy the clear panels needed to screw directly to the back of the 10mm wide vertical bar sections. This required drilling and threading for 240 screws. 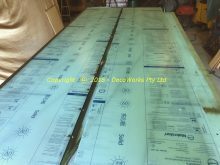 To simplify construction the panel operation geometry was done before the design was welded into them. 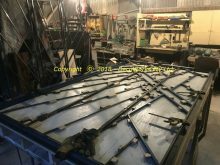 Once the panel folding geometry had been confirmed the PLAZA design was jigged into place in the frames and welded in position. The clear polycarbonate panels were attached after all the welding was completed. To accurately drill the screw holes in the panels dummy screws with sharpened heads were fitted into the screw positions and the polycarbonate was hit lightly with a hammer over each screw point to indicate where the holes should be drilled. Preliminary testing of the panel operation is shown in the video below. 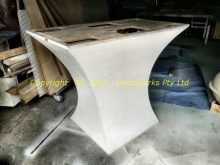 The folding panels are supported and slide inside tracking sections at the top and bottom. 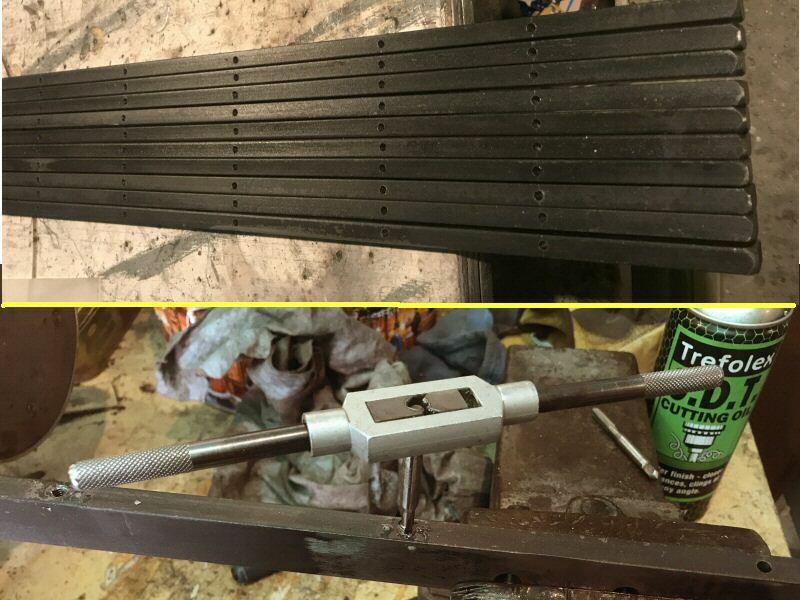 The bottom tracking can be removed when the panels are stowed open on each side. 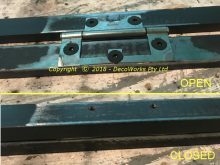 When closed the panels are secured together with a pivoting drop bolt. 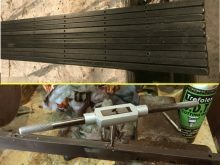 The operation of the panels is shown in the video at the end of the post. 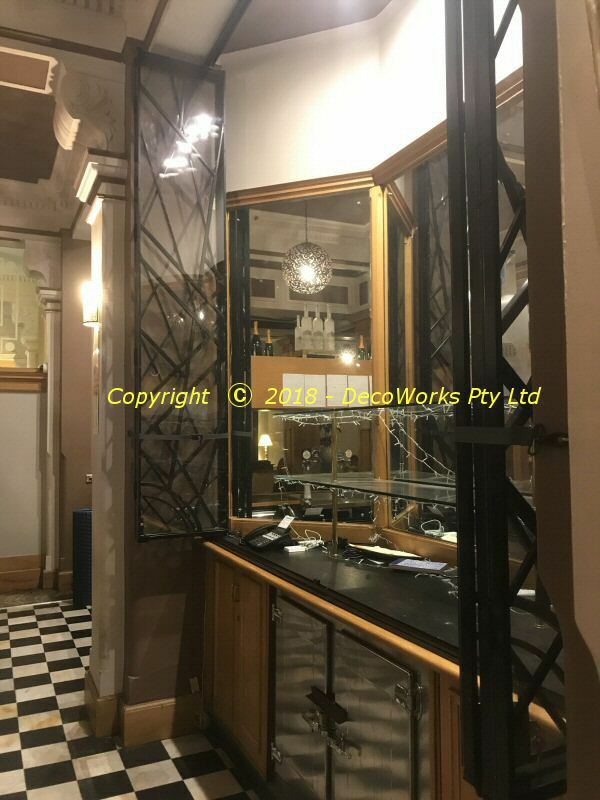 We usually apply our design skills to theatrical props and Art Deco security bars so it was a nice change to be offered the opportunity to design a website for the Wollemia Urology Centre in Gosford. 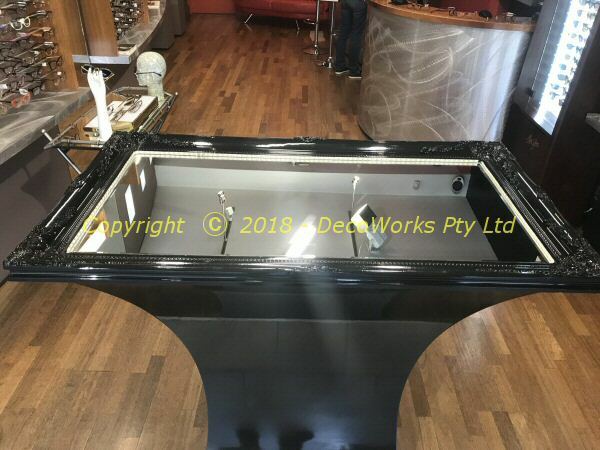 Rather than starting from scratch you can save yourself a lot of time by using one of the huge variety of website templates available on the Internet. There are many free templates available and for a small fee you can purchase one with a bit more pizzaz. 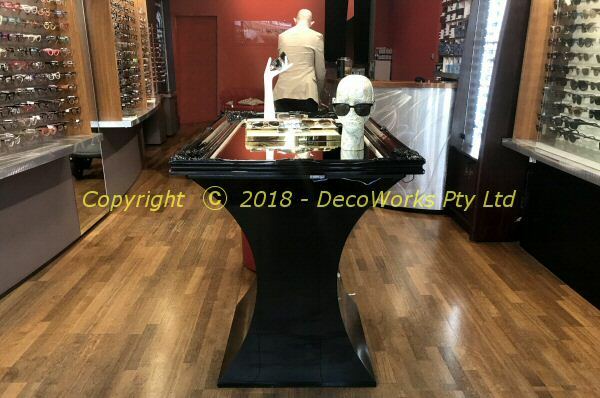 There is a tendency for websites to have lots of “bells and whistles” which can get tedious to wade through so our approach to the design was to keep it as simple as possible while still maintaining an appealing and distinctive look. The biggest challenge in using templates is deciding what features you don’t want to use. This is made doubly difficult with huge CSS style sheets that have been written to accommodate every feature in a template. Searching through the style sheets trying to find the code that will adjust a font to just so with just the right colour can get very time consuming. 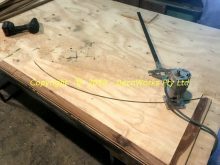 Its a bit of a learning curve to get things to do what they were not intended to do in the original template. We based the site on the free Proximet responsive website by Anariel Design. 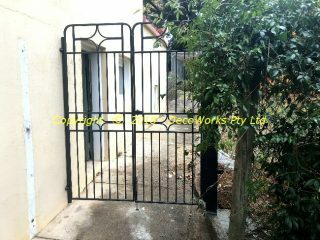 This offered a clean basic structure that was quite easy to adapt to our purposes. 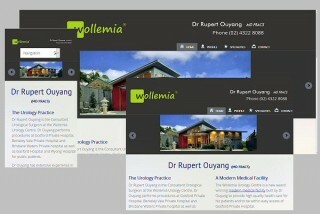 The usual way to build a site is to have all the content and build the site around it. We approached it from the other direction by seeing how the pages where structured and creating content to fit. It was a more organic approach and the site slowly evolved into its final form as it was literally sculpted into shape. The only Java script we retained was for the image slider on the homepage. It’s use on the other pages were felt to be too much of a distraction. When you have finished a site *always* do a spell check *and* get somebody else to proof read it for you. After days of staring at code the most glaring errors can be invisible to you until pointed out. Once all the content was finished SEO issues then reared their ugly head. SEO is another steep learning curve which really stretches the limits of your command of the English language. 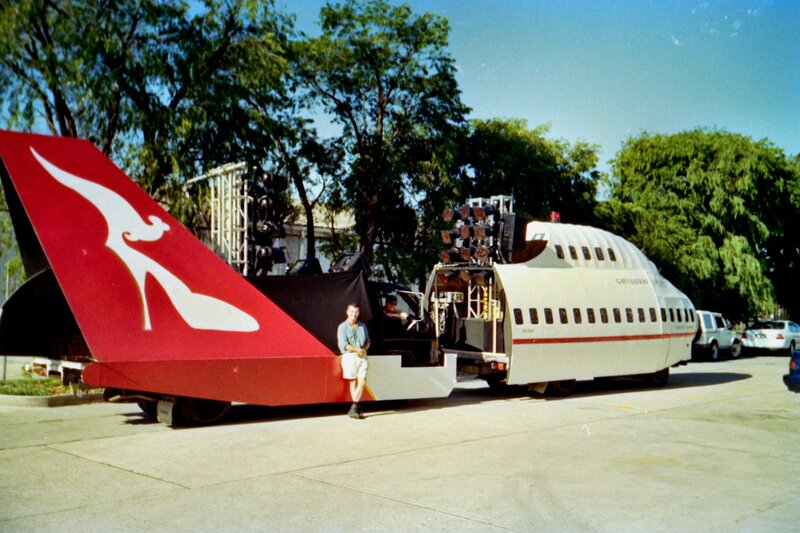 The photo opposite shows the Mardi Gras 1997 Qantas Jumbo 747 Gayviation float ready to go to the parade. 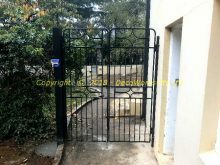 This post has been updated. 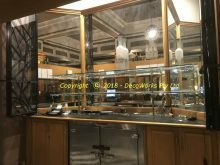 The new version can be found on this link. 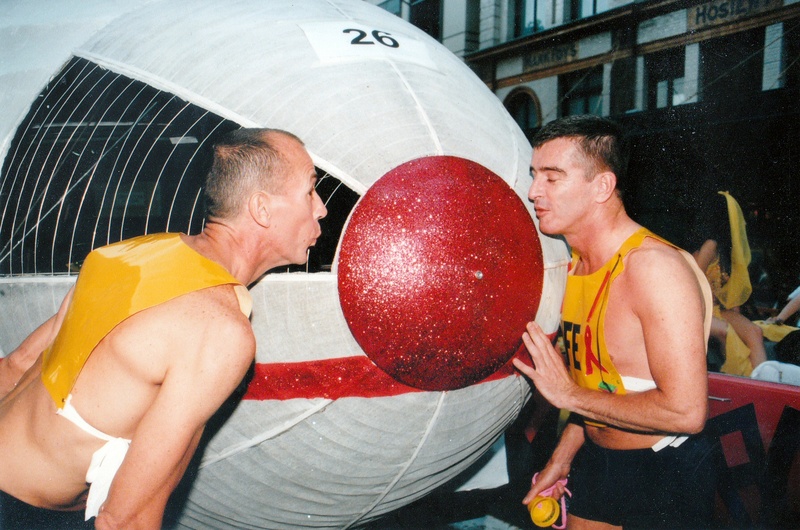 It provides some background information about the creation of the Gayviation entry for the 1997 Sydney Gay and Lesbian Mardi Gras parade. There were many creative entries in the recent 2016 Sydney Gay and Lesbian Mardi Gras parade in Sydney. 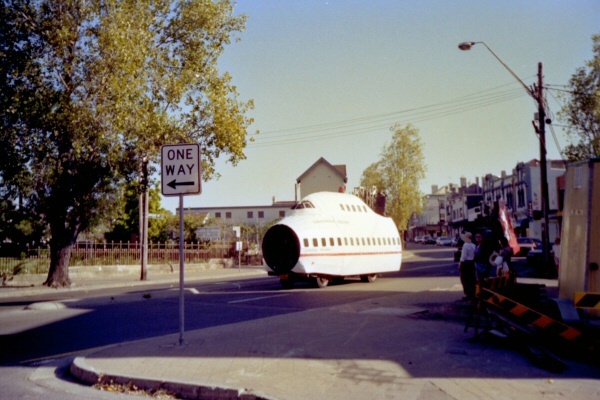 One that caught my eye was the Qantas #gay380 float which brought back memories from almost 20 years ago when the original idea of a Qantas 747 Jumbo float was first realized by the Qantas social group, Gayviation. Gayviation’s 1997 entry (one of 200 that year!) was the forerunner of the later large marching entries in the parade with almost two hundred people doing an airline safety demonstration dance routine to the music of Paul Capsis singing “I still call Australia home”. 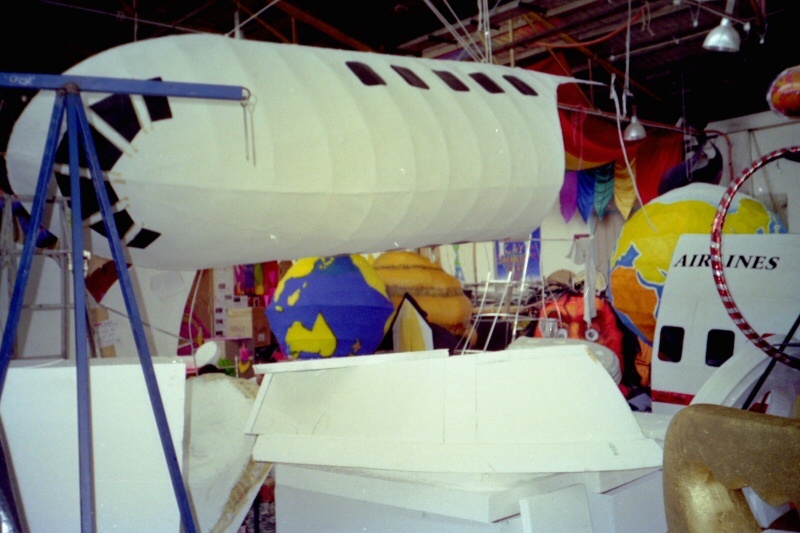 The entry won “Best of Parade” at the 1997 Mardi Gras Awards Night. This was a time before the ubiquity of digital cameras and social media so the only record of the time was predominately on film and VHS video. I went through my old negatives and scanned the photos taken in preparation for the 1997 parade and share them here with a brief narrative on the lead up to the parade. Click on any photo for the full size version. 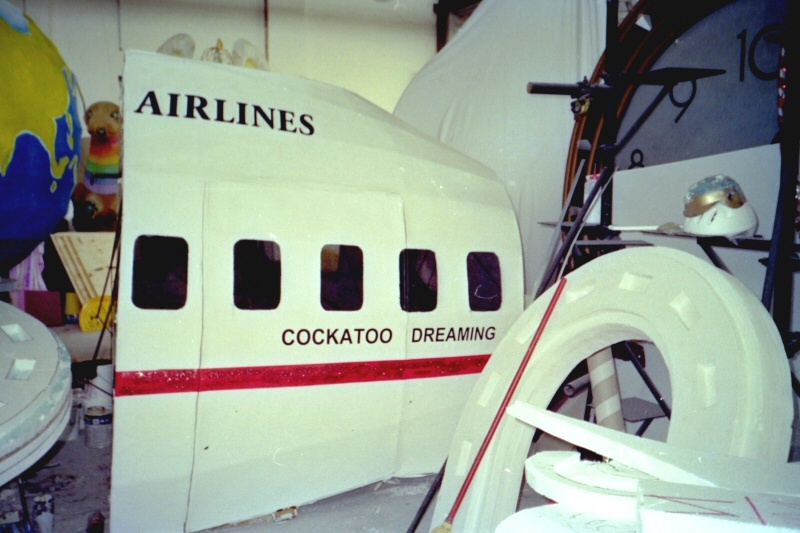 The front truck of the Qantas 747 Jumbo was christened COCKATOO DREAMIMG. Gayviation’s concept was very simple. 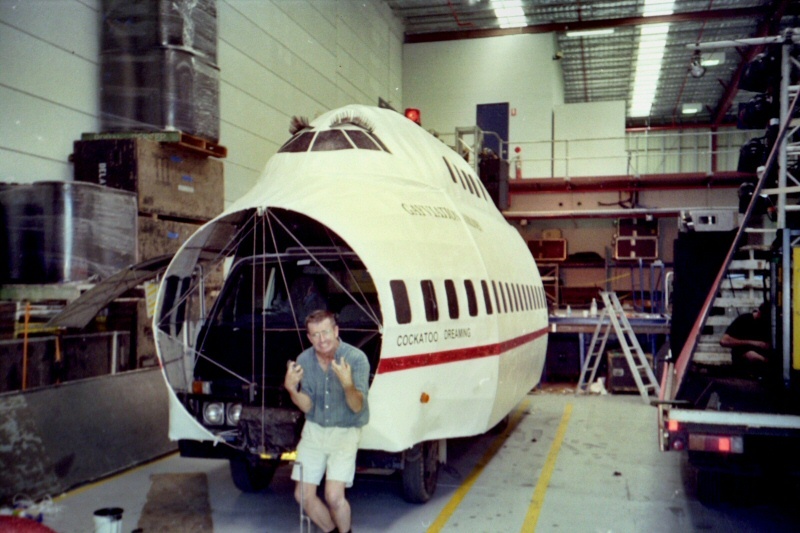 Tony Baker, their president, told me they wanted a Qantas 747 Jumbo float consisting of a front truck, being the nose and cockpit of the aircraft, and a rear truck being the tail. It was to go up Oxford Street with a large marching troupe between the two floats, representing the passengers, doing an airline safety demonstration dance routine to a dance track produced by Tiger Recording with Paul Capsis singing “I still call Australia home”. There were to be generators on both trucks to power lighting for the marchers and a complex sound system. Because of the length of the entry the marchers at the rear couldn’t hear the music from the front truck so a radio link was planned to feed the music from the front truck to the rear truck so those at the back could hear and stay in time with the music of the routine. 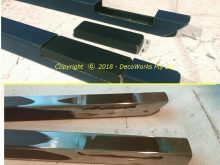 I set about designing a metal framework with the shape of a 747 fuselage that completely enclosed a tabletop truck. 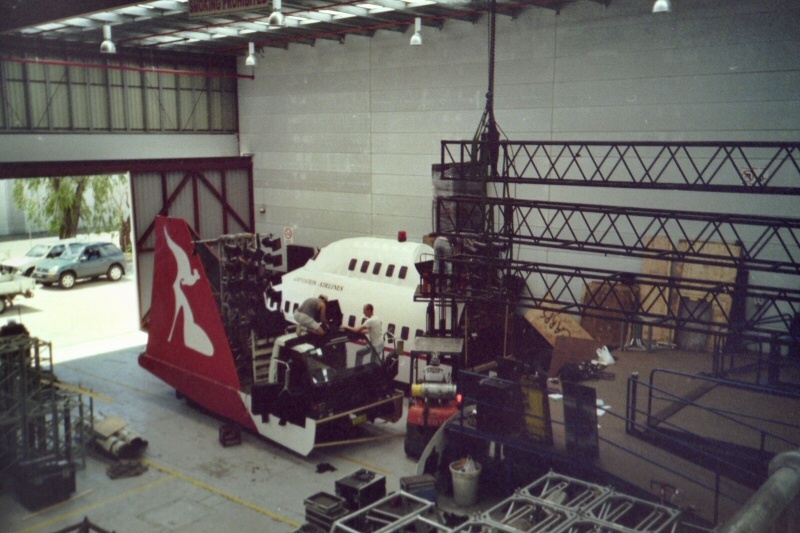 I was Head of Props at Opera Australia at the time and was allowed to use the workshop facilities in Surry Hills to build the float. It was built in five sections that bolted together to form the shape of the fuselage. 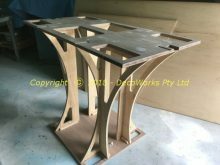 All the metal frameworks and wooden fuselage side panels were built at the Opera workshop and fitted to the truck. Once this was completed everything was transferred to the Mardi Gras workshop in Erskineville. 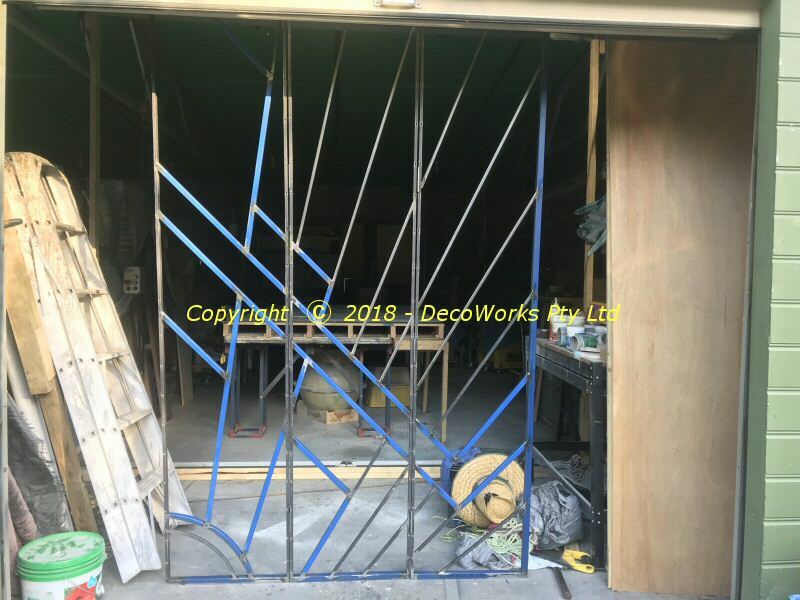 At the Mardi Gras workshop the steel frames were covered with chicken wire and then glued over with newspaper. Once it had dried it was painted white and had the signage applied. 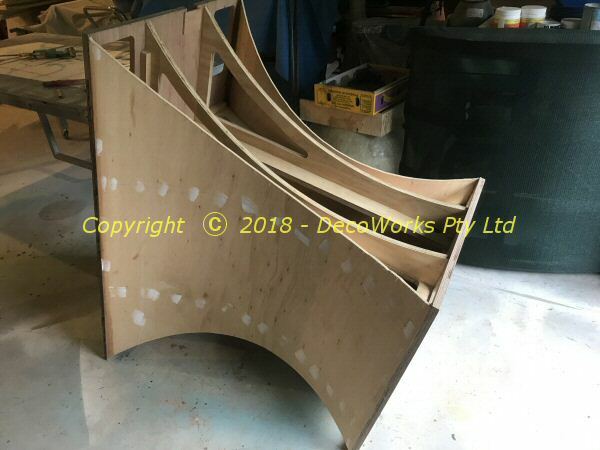 The tail section was built at the Mardi Gras workshop and consisted of a large inverted “V” shape made of plywood which would conceal the generator and sound system. 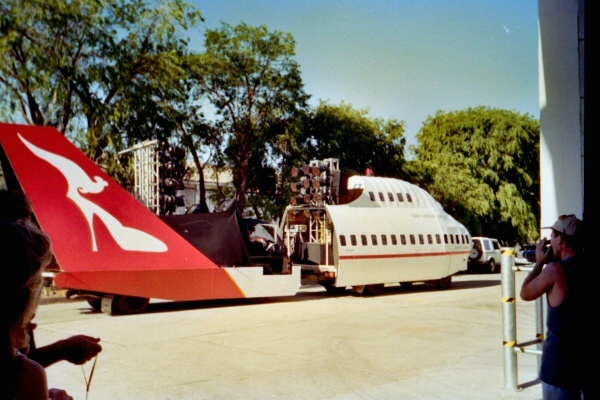 The logo on the tail of the flying kangaroo in a stiletto heel was the brainchild of one of the flight attendants at the time. The rest of the tail truck was masked with black fabric to highlight the tail fin. 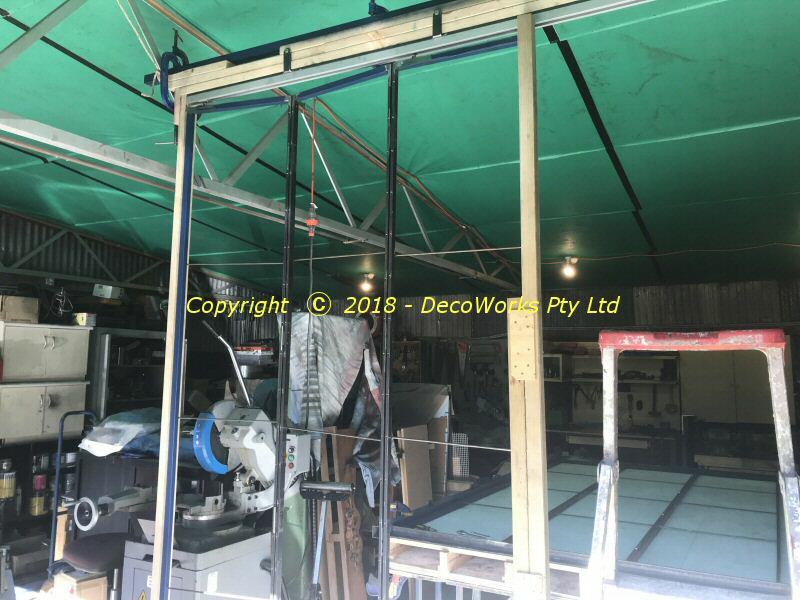 On the morning of parade day the front and rear trucks were assembled for the first time in the petrol station outside the Mardi Gras workshop and then driven to Jands lighting in Alexandria to have the lighting and sound systems installed. The installation of all the lights took a particularly long time which became quite stressful as the afternoon wore on. 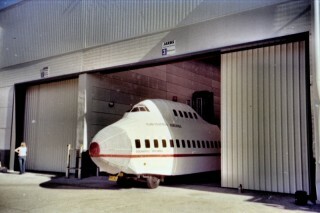 The removable front nose cone was covered in an open mesh material so that the driver of the truck could see out when it was fitted to the front of the fuselage frame. 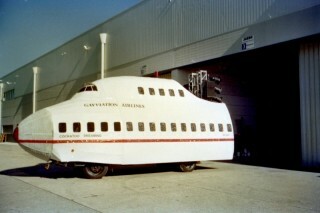 The side passenger windows were also aligned so that those next to the truck cabin could be used to see out to the side. COCKATOO DREAMING being driven out of its “hanger” for the first time was an exciting moment for all. Eventually all the lighting rigs and sound systems were finally connected up and tested. Qantas 747 Jumbo “Cockatoo Dreaming” was ready to see the light of day. It was an exciting and memorable moment for everyone to see it being driven out of the warehouse at Jands Lighting for the first time. 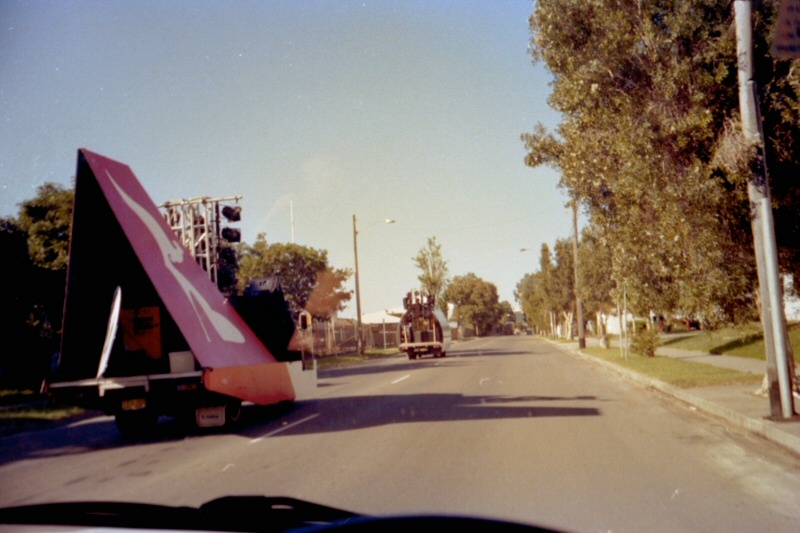 The picture below is the only time that the front and rear trucks were set front to back to show how the complete Qantas 747 Jumbo float looked before being driven to the parade marshaling area in the city. The front and rear trucks of “Cockatoo Dreaming” ready to go to the parade. Qantas 747 Jumbo Float passing through Redfern. As is generally the case, the best laid plans of mice and men go oft awry. After the Sun had set we discovered it was difficult for the driver to see through the nose cone section so a segment of material had to be cut out to give a clear view. The radio link with the rear truck also failed on the night so the marchers at the rear had to rely on visual cues to keep in time with the front marchers during the safety demonstration routine. Tony Baker and myself wishing “Cockatoo Dreaming” good luck just before the parade start. 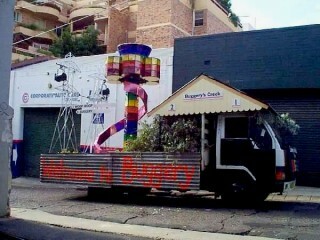 The following year Gayviation did another parade entry. The Qantas 747 Jumbo float from the previous year was ressurected with new livery and I built another float consisting of an illuminated rainbow coloured control tower which led the entry up Oxford Street. The float represented Buggery’s Creek International airport railway station and along with the illuminated model of the Sydney airport control tower featured a classic Sydney Rail railway platform built over the truck cabin. The power generator was concealed by several bushes behind the cabin. Two large power line towers, typical of Western Sydney, completed the picture and supported the lighting. 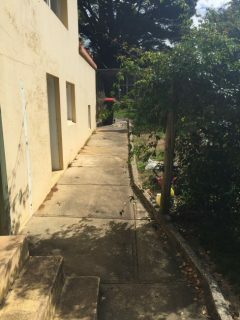 At the time there was hot debate about a new airport at Badgery’s Creek with a new rail link which is *still* going on as I write this post. I hope they end up putting in a fast rail link as it is “out to buggery” – an Australian colloquialism for a very long way away. Another one, “go to buggery”, is an impolite way to tell someone to “get lost” or “go away”. Below is a video of the Control Tower and 747 Jumbo in the 1998 Sydney Gay & Lesbian Mardi Gras parade. This is the commemorative patch of the Space Shuttle program which concluded with the flight of STS-135 (Atlantis) on July 8th 2011. 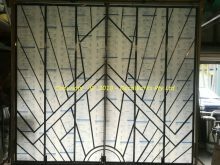 The fan shape which has been used is a popular motif of the Art Deco period. 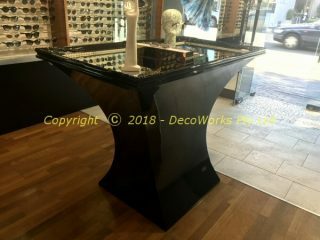 It is the basis of our Plaza, Regent and Regal security bar designs and has an uplifting and *into the future* feel about it. It fits perfectly with the ideals of the Shuttle program. 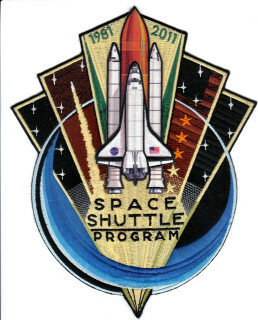 The final Shuttle flight patch, STS-135 (below) uses a similar motif but this time in reverse and is a representation of the engine thrust on takeoff. This also conveys an upward and uplifting feeling even though the pattern is reversed compared to the fan in the Shuttle program patch. The prominent *omega* symbol is a nice choice being the last letter in the Greek alphabet. Each mission had its own patch design but these two are my favourites. 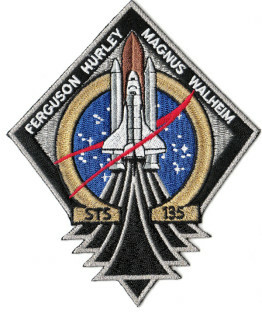 The final Space Shuttle flight STS-135 – Atlantis on 8th July 2011.